Paramedics say it was reported the driver of lost control resulting in the vehicle coming to rest in a ditch. 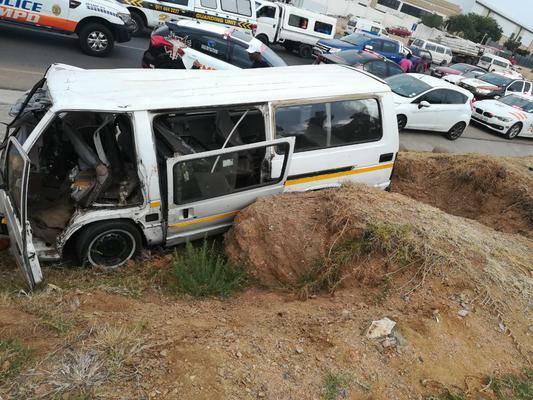 At least 10 people were injured on Friday morning when a mini-bus taxi they were travelling in lost control and crashed on the R55 Main Road in Kyalami, Midrand. Netcare911 spokesperson Shawn Herbst said that their paramedics responded to reports of a collision on the R55 Main Road in Kyalami, Midrand. “Reports from the scene indicate that the driver of a mini-bus taxi lost control resulting in the vehicle coming to rest in a ditch. Ten occupants from the vehicle sustained minor injuries and were transported by various ambulance services to hospital for further treatment,” Herbst said.